Japanese dragon meanings as well as the Japanese dragon symbols are very similar to Chinese dragons. One big difference is the Japanese dragon has only three toes or claws while the royal Chinese dragon has five claws and the common Chinese dragon has four toes. There are two basic types of Japanese dragons. Dragons are believed to control rain, fire, and the earth. Another type of Japanese dragon is found in the sky or clouds. There are similarities and differences between Japanese and Chinese dragons. One of the main differences between the two is the number of toes each has. Mythology and meanings are similar, most likely because the two share similar origins in ancient Chinese civilization. It's believed that the dragon originated in Japan with only three toes and as it migrated North, it gained another toe. It finally traveled far north where it received its fifth and final additional toe or claw. In the Japanese language there are quite a few words for dragons. Two of the most popular words are ryu and tatsu, the latter is taken from an old Japanese dialect which translates in English to mean "sign of the dragon." Kanji is modern Japanese for dragon. Dragons are the embodiment of yin and yang. The Japanese dragons, as with most Asian dragons, are slender and long like a snake and are a composite of nine different animals with chin whiskers. Depictions of dragons are used throughout the Japanese culture as symbols of strength, courage, and magic. Unlike the dragons found in Western mythology, Asian dragons don't have wings, but most can fly. Asian dragons can fly due to a knot on top of its head called Chi'ih muh which magically enables it to fly. Some dragons can also live underneath the water and were believed to reside in large bodies of water such as lakes and oceans. 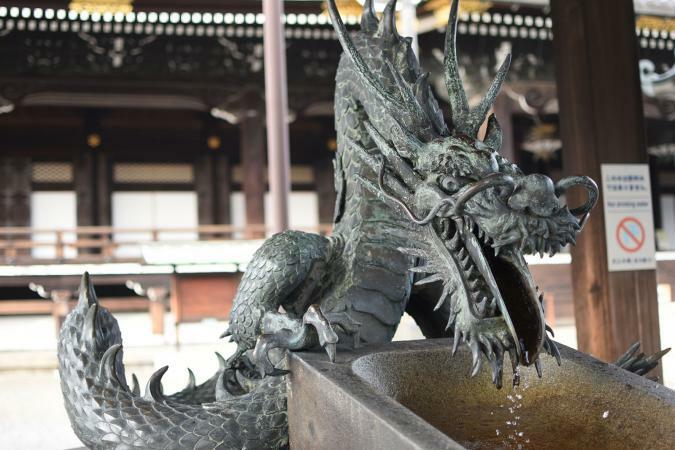 You'll find plenty of dragon symbols in Buddhist temples and Shinto shrines, especially those located near bodies of water. It's very common for temple and shrine names to contain the word dragon in them. Dragon motifs and paintings adorn temples and shrines. Many of the ceilings have painted murals depicting various dragons. Dragon heads often adorn bells and other objects. Japanese dragons are also used in a wide variety of stylistic depictions found in historic and modern tattoos. If you're thinking about getting a dragon tattoo, you'll want to take the time to study various designs that represent the dragonlike strengths and traits you possess or wish to draw to you. There are many color combinations available for these detailed designs. 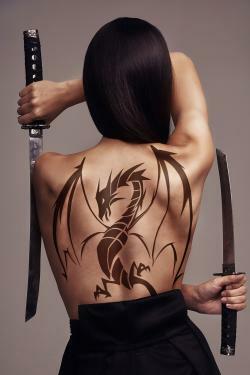 The Japanese believed that if they had a dragon tattoo it would imbue them with its power and magic. Japanese dragons are tied directly to deities. Many of the Japanese gods shape-shifted into dragons. Japanese mythology has an abundance of stories about gods and dragons. This sea god is also known as the dragon god, Ryujin, and has the ability to shape-shift into human form. Former sea goddess rode a dragon. Two myths surround this goddess. Both state she married a dragon king to stop him from terrorizing the people on an island. Her love transformed her dragon king husband and Benten became the goddess of love. Later her favors were bestowed upon artists and muscians. The union of Benten and the dragon king symbolizes the balancing power of yin and yang. This dragon guards and protects the zodiac. Symbolizes leadership. A priest fell in love with a young woman and soon tired of her. Abandoned, the woman studied magic at a temple and transformed into a dragon. She attacked the priest who attempted to find refuge underneath the monastery bell. Kiyo breathed fire and melted the bell, killing the priest. Kiyo symbolizes vengeful power and the consequences of giving into desire. White dragon that appears every fifty years, transforming into the shape of a golden bird. If O Goncho cries out, the world will endure a famine. O Goncho symbolizes lack. The dragon king wanted to eat a monkey's liver to cure a rash. He sent the jellyfish to fetch a monkey, but the monkey tricked the jellyfish When the jellyfish returned empty-handed, the outraged dragon king beat the jellyfish until all of its bones were crushed. This is why the jellyfish has no bones. Ryujin symbolizes the power of the sea. Sea dragon who married a mortal man, bore his son then returned to her undersea world. The son married Toyo-tama's sister and bore the first emperor of Japan, descendent of the dragons. Toyo-tama symbolizes true love. Contrary to many beliefs, Japanese dragons aren't always benevolent. There are many myths about dragons that are malevolent like western mythological creatures. And while the majority of Japanese dragons don't have wings, there are still several ancient stories of winged dragons. This dragon symbolizes looking all ways before taking action. This drgaon symbolizes the concept you're never finished until the last task or detail is completed. This dragon symbolizes hidden truths and the freedom gained by discovering the truth. Japanese dragon symbols are evidence of myths that have formed a complex belief system within the Japanese culture.